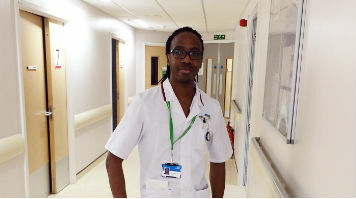 Adult Nursing student Dane Thompson has been shortlisted for a prestigious Cavell Nurses' Trust award, as part of the Trust's annual scholarship awards. Dane has been nominated for the 2013/14 Community Award as part of the Cavell Nurses' Trust scholarship awards. As part of the next stage of the process Dane, along with 28 others on the shortlist will be interviewed by a panel of judges. The panel consists of leading nurses and midwives, including Professor Lesley Page, President of the Royal College of Midwives and they will choose the finalists in February 2014. The winners will receive up to £2,000 to put towards furthering their professional practice here or abroad, with a total of five award categories covering academic achievement, outstanding student midwife and nurse, leadership and community. Cavell Nurses' Trust provides financial help and support for nurses, midwives and healthcare assistants during their journey from training to retirement following personal difficulties. "I am astonished but also very humbled to be shortlisted,", Dane says about being shortlisted. "It is also pleasing to see students being recognised for the hard work they put into upholding the high standards set by LSBU, tutors and mentors to provide exceptional patient care." Cavell Nurses' Trust was formed in the early 1900's following the execution of British nurse Edith Cavell during the First World War in 1915. There is currently an online petition, calling for Edith Cavell to be commemorated on a £2 coin in 2015 which will be the centenary of her death. For further information about Cavell Nurses' Trust, please visit the Cavell Nurses' Trust website.